What is Sin These Days? Posted on August 3, 2015	by Rev. Joe Jagodensky, SDS. “Don’t judge,” I’m sternly told about someone having three kids with no husband or no wife. “You just don’t understand” is the statement given to level off off all kinds of behavior. “You’re just wrong” is my dismissal when a conversation gets sensitive or personal. 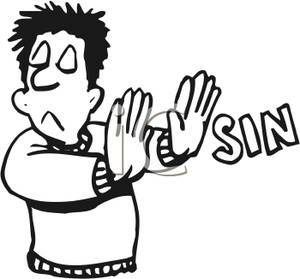 Judging, understand and being wrong dismisses centuries long definitions of sin. You simply (and happily) cannot commit a sin any longer. It’s wonderful how this sin-thing was resolved. We did it all by ourselves in our own little worlds influenced by others and questioned by none. I think the only sin remaining is murder and that can be justified in more ways than the direction of the bullet or the knife. I’m not one to impose sin upon another or condemn behavior, as much as priests may like to do, but it still intrigues me these days in our country how sin has been reduced to something that someone else has done but never nailed to me. Jesus died for a reason and the reason is idolatry which is defined not always as another god but more powerfully making ourselves a gods of sorts. Growing up sin abounded in our lives. Missing your “morning prayer” was a sin, whatever that morning prayer was supposed to be. A burp in church caused you to mention it in your next confession. Too strict and rigid? Too outdated? Yet a slander or speculation about someone on Facebook or in conversation is considered information and therefore not sinful, if indeed inaccurate or wrong. The broke mother who shoplifts for her children is sinless unless she does it for herself. The drunk driver who kills another person is sinless because his wife just died. What’s a sin these days? Corporations who do their own thing but never held accountable? Those are the easiest to call sinful because no single person (or persons) are ever accountable. It’s a comfortable time for us. We’ve conveniently eradicated the cancer of our faith. There is no more personal sin from our habits, behaviors or lives. It’s the other person who seems to fail, it’s that person who I don’t like who has a problem. When you are god you can do and think all kinds of things. This entry was posted in Spirituality and tagged Sin. Bookmark the permalink.